Breaking news: RFU have cancelled ALL of this weekend's senior and junior festivals due to the weather, flood warnings, and saturated pitches. See here for official statement. After last nights 16-13 win over New Zealand the England are on the verge of becoming the best in the women's rugby team in the world - ever. In fact the top six have been pretty much unchanged for the past 20 years or so, but if England were to win the current series 3-0 we would see the first significant change for two decades. 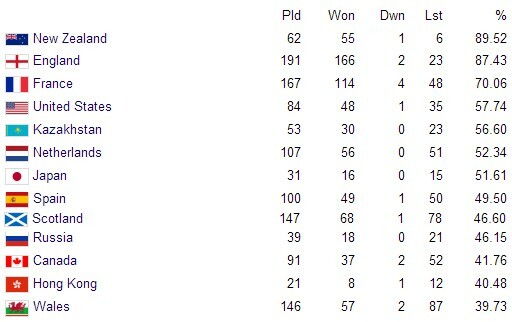 For the first time ever England would go top. England's record would go up to 87.56%, while New Zealand's would fall to 86.72%. Even if England were to win only 2-1 the gap would close to barely one percentage point, which is pretty remarkable as after the World Cup the gap was nearly 10 points. 20 years after the NZRU took over the running of the women's game, a remarkable article has appeared highlighting how badly treated the women are ("NZRU must stop treating top Women rugby players as Second Rate"). When rugby tournament have to cut costs it the women's teams that suffer; the Black Ferns will be playing with shirt sponsors next week but thus far it seems none of this money is making its way into the women's game (the entire tour is being funded by the RFU); and it seems the NZRU's funding of women's sevens may even be illegal under the rules of Olympic sport so far is it behind their funding of the men's game. Yet despite all this the Black Ferns will undoubtedly be the greatest challenge England will face all year. Four times world champions despite their governing body the information detailed in this article shows that they must be the greatest miracle workers in modern sport. Not played rugby since the U18s? Or back from university, but without a club? Then there is special festival for you! 19th December is normally the date for the boys students festival, for players who've gone off to Uni and are back for Christmas. However for the first time a senior ladies match has been organised - if there are enough people interested in playing! If you are interested contact philipkearns@rfu.com - by 16th November. It takes some planning so please please let him know if you are interested. A chance find had revealed a collection of 45 fascinating photos of women's club and international rugby in England and Wales from the mid-1980s. 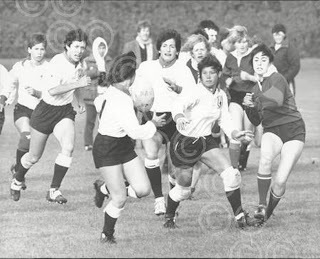 That may be barely 30 years ago, but for women's rugby its almost prehistoric! Several pictures (right) from games involving the Wiverns - the first ever women's rugby team from the US to tour Europe. A national side in all but name (the USA - and come to that England - had not started playing test rugby in 1985), the Wiverns went undefeated throughout a long tour of the UK and France. Many of the players went on to be part of the USA team that would win the first World Cup six years later. A picture (left) from the first ever women's test match to take place in the UK - Great Britain vs France, a year later. The picture shows France's Maris Gracieux tackling Great Britain's Suzy Hill. The match took place at Richmond in London on 19th April 1986, France winning 14-8. If you look carefully you see that the GB team have tape around their arms. This is because apparently the GB shirts only arrived minutes before the kick-off - and were found to be several sizes too big. The players had to tape up the sleeves to stop them flapping around... but the shirts still seem a big baggy! Various club and university matches from in and around London are also featured (some in some very dodgy kit), one including a very young Carol Isherwood, as well as two pictures of the New Zealand team from the first world cup in 1991 doing a haka - apparently in the middle of a huge open field. It all makes for a fascinating bit of women's rugby history.